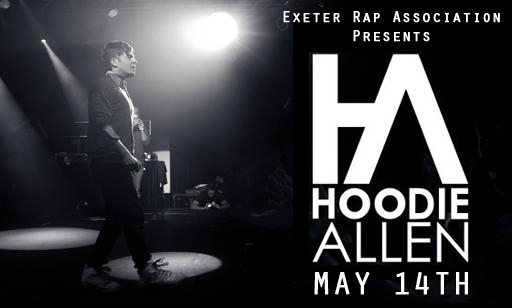 I am happy to announce that the headliner for this year’s ERA Spring Concert will be Hoodie Allen! Hoodie gained popularity in the Hip-Hop world with his song, “You Are Not A Robot” (video below), which samples Marina & The Diamond’s “I Am Not a Robot”. A few months later, Hoodie dropped the mixtape, Pep Rally. Since then, Hoodie has been touring the country and making more solid music. Recently he was featured on Fortune Family’s mixtape, Paradox. Hoodie is a very talented lyricist and is known for sampling a lot of popular indie music. I encourage you all to download Pep Rally. Listen to it and get pumped. Stay tuned for information in the coming weeks regarding the concert venue and Hoodie’s opening act. This entry was posted in Club News and tagged era concert, hoodie allen, i am not a robot, Marina and the Diamonds, may 14, Pep Rally. Bookmark the permalink.